Financial Accounting 9 Edition Student success is a team effort. The Team for Success is focused on helping millennial students get the most out of their accounting courses in the digital age, and on helping instructors deliver the most effective courses whether face-to-face, hybrid, or online with model course plans designed for easy and effective implementation. More students get accounting when using Weygandt Financial Accounting with WileyPLUS, because of the unique Framework of Success created and refined by the authors based on years of teaching and course design experience. 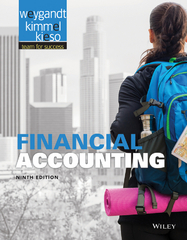 In WileyPLUS and in print, clear and relevant exposition, engaging visuals and videos, and effective end-of-chapter material work together to build students confidence and mastery of accounting concepts and skills. Financial Accounting with WileyPLUS by Weygandt, Kimmel, Kieso provides students with a clear and comprehensive introduction to financial accounting that begins with the building blocks of the accounting cycle. WileyPLUS sold separately from text.